This month marks a dark anniversary in state history. 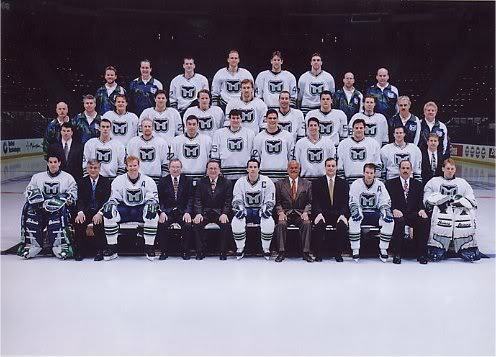 On March 26, 1997 the Hartford Whalers announced they were leaving Connecticut, a blow to the city and the state, from which it still has not fully recovered. In this Sunday’s Face the State flashback, we took you back to March of 1997. In the beginning of that month, the effort to save the team was in full gear, but a few weeks later, team owner Peter Karmanos announced the team was out of here, breaking hearts of fans from Greenwich to Groton to Goshen to Grosvernordale, and all points in between and beyond. In our flashback, you’ll see a report I filed on March 12th, as talks were going on between state officials and Karmanos, and as a study was released showing the huge impact the Whalers had on the economy. You’ll hear from John Carbone, who told me that night if the Whalers were to leave, his Gaetano’s restaurant would have a dim future. He was right. Gaetano’s closed less than two years later, as the Hartford Civic Center mall was slated for demolition. In fact, along with Gaetano’s, not a single restaurant or store that was in the mall when Whalers played their final game is open today. Not one chose to set up shop again in the renovated Hartford 21 or in downtown, not even Wendy’s. We also aired a vintage report from Jeff Cole filed on the day that shattered the dreams of fans, merchants, city and state leaders. You’ll hear from Karmanos as he explains why he was yanking the Whale out of the Constitution State. A Boarding School in Hartford? Dennis I just watched your 2/9/13 spot on face the state with gov.Malloy the spot showed a story of my son who was a patient at UConn, as you know they supported uconn childrens cancer program. there my son was in his bedroom, describing his “whalers shrine. I just called my son in AZ he hopes the whalers return to CT. I think we all hope they return. Thanks, Margaret and tell your son, go Whale! i’ve also added the link to the post so he can watch the segment. Pingback: CT Boom| Connecticut. INSIDE OUT.